SHOW A HEART (AUS) (Chestnut 1997-Stud 2002). 6 wins-3 at 2, VATC Caulfield Guineas, Gr.1. Leading NZ Sire of 2YOs 2006-07. Sire of 753 rnrs, 489 wnrs, 23 SW, inc. Heart of Dreams (VRC Australian Guineas, Gr.1), Toorak Toff, Woorim, Mimi Lebrock, Luke's Luck, Vo Heart, Rightfully Yours, Gotta Have Heart, Royal Tithe, I'm Your Venus, Super Ninetyseven, Crossyourheart, Heart Ofthe Desert - Hostwin Donatello (Mac. ), Dual Chamber, Fifteen Carat, etc. LA PHILLYHARMONIC, by Carnegie. 4 wins from 1350m to 1600m, TRC Raine & Horne Hobart H., Bravehearts Keep Safe H., 3d TRC Austar for Business H. Dam of one named foal. La Phillyharmonic. 4 wins. See above. Marlene Gaye. 4 wins from 1800m to 2150m, BTC Carlton Draught H., 2d BTC Hardy Brothers Jewellers 3YO H. Producer. Vicarious. 3 wins at 2, AJC St Aubins 2YO H., STC Saratoga 2YO H., AJC Raine & Horne 2YO H., 3d AJC Glen Alpine H., STC Hawaii 2YO H. Producer. Duke of Braggart. 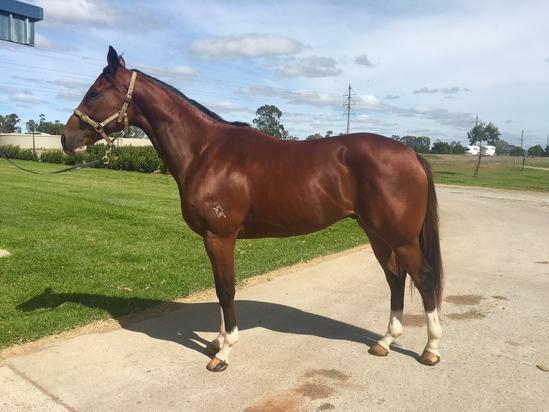 Winner at 2, STC Faulconbridge 2YO H., 3d STC Bravery 2YO H., Sans Souci 2YO H.
Jeram Delight. 7 wins to 1400m, 522,478Rgt. in Malaysia, Selangor TC Macau Jockey Club Goodwill Cup, 2d Selangor TC Class 1 H.-twice, Astro Wah Lai Toi Vase, 3d Perak TC Class 1 H.-twice, 4th Penang TC Malaysian Magic Millions Classic, L.
WAAJIB (Try My Best). 7 wins at 1600m, 1700m, £187,732, Royal Ascot Queen Anne S., Gr.2, Epsom Diomed S., Gr.3, Longchamp Prix du Rond-Point, Gr.3, Goodwood Schweppes Golden Mile H., Sandown Selfridges Whitsun Cup, 2d Goodwood Waterford Crystal Mile, Gr.2, 3d Phoenix Park Pacemaker International S., Gr.2. Sire. CONILLON (Acatenango). 2 wins-1 at 2-at 1600m, 2000m in Germany, Grosser Preis der Sparkasse Dortmund, L, 2d Düsseldorf Deutschland Preis, Gr.1, 3d Cologne Oppenheim Union Rennen, Gr.2. Sire. COTE D'AZUR (Arazi). 3 wins from 2000m to 2600m, Cagnes-sur-Mer Grand Prix du Conseil General des Alpes-Maritimes, L, Hollywood Park Jim Murray H., L.
SPECIAL NASH (Nashwan). 5 wins at 2, Rome Premio Guido Berardelli, Gr.2, Florence Premio Toscana, L, Naples Criterium Partenopeo, L, Premio Linz, 2d Milan Premio Giuseppe de Montel, L. Sire. CALIFORNIAN (Zafonic). 3 wins at 9f, 1¼m, Keeneland Forerunner S., L, 2d Santa Anita San Luis Obispo H., Gr.2, Arlington Park American Derby, Gr.2, 3d Sandown EBF 2YO S. Sire. Boloardo (Persian Bold). 2 wins at 1m, 9f, Goodwood House S., 3d Sandown Gordon Richards S., Gr.3, York Silver Cup, L.
Rasm (Darshaan). Winner at 1¼m, Newmarket Wates Group S., 2d Ascot New S., L, 3d Royal Ascot Wolferton H., L, Newbury Rundle & Co S.
KELTOS (Kendor). Champion Older Male Miler in France & GB in 2002. Top of The 2002 International 4YO+ Classification (Mile). 9 wins from 1400m to 1600m, £125,810, €167,050, 387,161fr., Newbury Lockinge S., Gr.1, Saint-Cloud Prix du Muguet, Gr.2, Prix Perth, Gr.3, Chantilly Prix de Pontarme, L, Saint-Cloud Prix Tantieme, L, Longchamp Prix du Vert Galant, Saint-Cloud Prix Callistrate, Prix Volandry, 2d Newmarket Challenge S., Gr.2, Deauville Prix Quincey, Gr.3, Nantes Grand Prix Anjou Bretagne, L, Vichy Prix Jacques de Bremond, L, 3d Saint-Cloud Prix Perth, Gr.3, Longchamp Prix du Pin, L. Sire. KRATAIOS (Sabrehill). 13 wins from 1400m to 2000m, €406,380, Saint-Cloud Prix du Muguet, Gr.2, Prix Altipan, L, Maisons-Laffitte Prix Jacques Laffitte, L, Grand Prix de Marseille, L, Longchamp Prix du Pont au Change, Prix du Gros Caillou, 2d Saint-Cloud Prix Omnium II, L, 3d Longchamp Poule d'Essai des Poulains, Gr.1, Prix d'Ispahan, Gr.1, Nantes Grand Prix Anjou Bretagne, L.
LOXIAS (Saumarez). 6 wins from 2000m to 2500m, €221,155, Saint-Cloud Prix Jean de Chaudenay, Gr.2, Le Lion-d'Angers Derby de l'Ouest, L, Lyon-Parilly La Coupe des Trois Ans, L, Maisons-Laffitte Prix Verso II, Saint-Cloud Prix a Tempo, 2d Longchamp Prix d'Hedouville, Gr.3, Saint-Cloud Prix Aveu, 3d Grand Prix de Saint-Cloud, Gr.1, 4th Longchamp Prix du Lys, Gr.3. Sire. KAVAFI (Zafonic). 6 wins-1 at 2-at 1600m, €180,140, US$600, Deauville Prix Quincey, Gr.3, Saint-Cloud Prix Altipan, L, Nantes Grand Prix Anjou-Bretagne, L, Maisons-Laffitte Prix des Boucles de la Seine, 2d Grand Handicap de Deauville, L, 3d Deauville Prix Luthier, L. Sire. IRIDANOS (Sabrehill). 6 wins-3 at 2-from 1400m to 1600m, Saint-Cloud Prix Omnium II, L, Grand Criterium de Bordeaux, L, 2d Chantilly Prix de la Jonchere, Gr.3, Saint-Cloud Prix Edmond Blanc, Gr.3. SERIAL WINNER (Yagli). 5 wins-1 at 2-at 1500m, 1600m in Brazil, Cidade Jardim G.P. Presidente Antônio T de Assumpção Netto, Gr.3, 2d Cidade Jardim G.P. Presidente da Republica, Gr.1, 3d Cidade Jardim G.P. ABCPCC Matias Machline, Gr.1. SETEMBRO CHOVE (Fast Gold). 9 wins from 1500m to 1800m, S$822,137, 80,960Dhs in Singapore and Brazil, Gavea G.P. Presidente da Republica, Gr.1, Cidade Jardim G.P. Governador do Estado, Gr.2, G.P. Henrique de Toledo Lara, Gr.3, Singapore TC Kranji Mile, L, Cidade Jardim Classico Semana Internacional, L, Singapore TC Open H., 2d Singapore TC Raffles Cup, L, Patrons' Bowl, L, Chairman's Trophy, L, Nad al Sheba Al Rostamani Group P., 3d Singapore Derby, L, 4th Singapore Airlines International Cup, Gr.1, Singapore TC Queen Elizabeth II Cup, L. Sire. Setembro Neva (Redattore). Placed in Brazil, 2d Cidade Jardim G.P. Joao Adhemar de Almeida Prado, Gr.1, 3d Cidade Jardim G.P. J Adhemar de Almeida Prado, Gr.1.